Control your lighting system with a mechanical button wall plate, available in Hartland, Hartland CFX®, Sheer, Sheer CFX® and Linea CFX® ranges. Any button can be configured for any function with Hamilton’s designer software. Controllers will fit into any single wall box (BS4662) with a minimum depth of 35mm. 1. Adjust the lighting levels using the circuit buttons. A brief press will turn the lights on/off, a prolonged press will raise/lower the light level. 2. Once you’ve selected the desired light level for all four circuits, press and hold down scene button one. The LED will flash five times. Keep your finger on the scene button until the LED stops flashing. 3. Your new scene is now stored. Repeat above to store further scenes on buttons 2,3 and 4. No commissioning work is required. 4. To recall a scene, press the desired scene button. To turn the zone off press the currently selected scene button. 5. To adjust a circuit without changing stored scene simply press or hold desired circuit button. For connection of additional controls use CAT5/6 cable wired in parallel. Note: if other dimmer packs are included within the same system, link all with CAT5/6 cable. 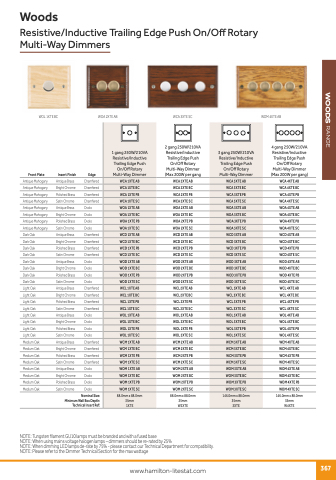 You can also add additional wall plates by duplicating the DIP switch setting. To recall a scene press any Scene button, 1-4. The LED will go bright. To turn off simply press any of the scene buttons that are brightly lit. Press and hold to adjust light levels. Note: A quick push of individual circuit button turns circuit on or off. Control plate with white LED back light. Controllers will fit into any single wall boxes (BS4662) with a minimum depth of 35mm. Sheer, Sheer CFX and the Linea CFX ranges.